VM Handicraft Copper plating Charger Plate, Size: Dia 13"
Durable yet beautiful are the charger plates and coasters that we offer as they are made of stainless steel and have beautiful designs on them. They are polished to add grace and thus making them special. We are a renowned manufacturer and exporter of a prominent array of SS Charger Plate. 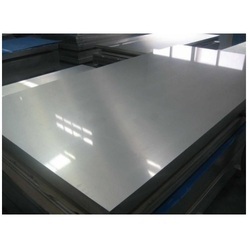 We are engaged in offering a wide assortment of Steel Charger Plate for the customers. 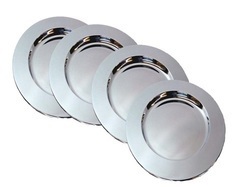 The offered charger plates are made from Stainless steel in polished finish. Our range of Steel Charger Plates is highly appreciated among the buyers owing to its qualitative features. This Faux Leather Charger Plate is manufactured from stainless steel with faux leather pasted on its 2 inch border to make it more beautiful. This plate is available in polished finish. We have lot of designs and shades in this range. Crystal Charger Plate made of very high quality stainless steel with Nickle Finish. Navraj Exports are Manufacturer and exporter of high quality Stainless Steel Tablewares item and offer wide range of Steel wares like Stainless steel charger plate , 33cms Stainless Steel Charger plate decorated with Brown color resin. We are the manufacturer and supplier of wide array of Charger Plates . To meet the diverse requirements of customers, we offer these products in various designs and sizes. Wholesale distributor of charger plate, wedding charger plates and stainless steel charger plates. stainless steel charger plate offered serve the purpose of both utility and functionality. The steel charger plate carry wonderful design.